The following is a series of observations, speculations, and inspirations regarding Cosmic Correspondences. Hope you enjoy reading. Our Chakras emit subtle frequencies associated with particular moods and emotions. (A mood is a passive emotion). Observe the news as stories develop around the new and full moons. Compare that to the news for the rest of the month. 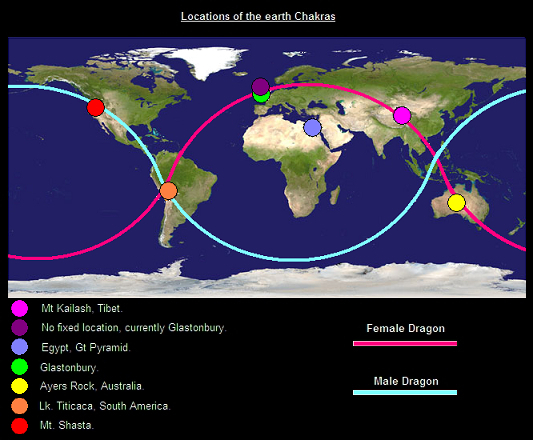 Check in particular for those stories coming from the regions of the Earth claimed to represent the chakras. By analysing the tone of these events we may help ourselves to see how, collectively we are manifesting these situations. In the diagram above, the violet and blue Dragon Paths correspond to Ida and Pingala, the twin lines of energy that spiral up the spine from the base to the crown. They also correspond with the Serpents on the Cadeauceus, the ancient symbol of healing. We would suggest that the Earths’ Sushumna, (the rod of the Cadeaucues), corresponds to the magnetic poles as their currents spiral into and out from the Earths’ core. The rod also represents the spine, while the sun or Pine Cone often depicted on top of the rod represents the Pineal Gland, the crown chakra. 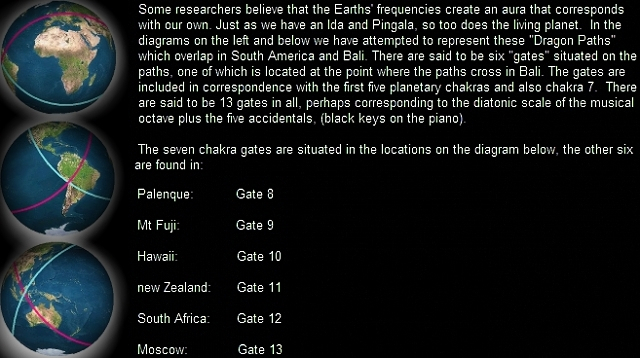 There are other models of Earth chakras, but the inspiration for the above diagram came back in ’04, reading : http://www.rajunasrefuge.com. Sadly I can’t remember right now why Cairo is not on the line, but I dare say any reader who is sufficiently motivated can find more up to date information on good ol’ google. Personal research is the most rewarding kind. 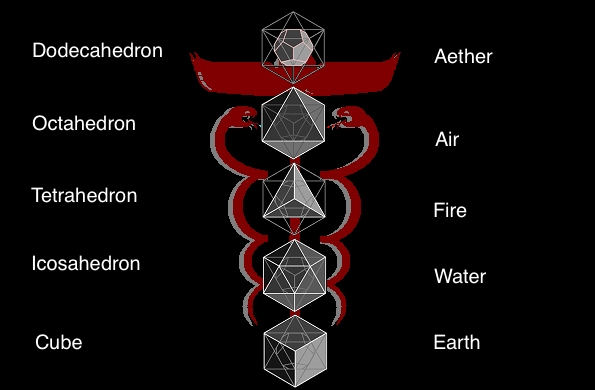 In the diagram below, we see how the Platonic Solids correspond with the chakras. According to Tibetan systems, the Base is combined with the Sacral, while the Brow is combined with the Crown. Tibetan scholars made these combinations because of the observed effects of sounds upon the chakras, and how these effects are related to the ancient elements.